Thinking about updating your kitchen with new countertops and cabinets? Great idea! Kitchen renovations tend to offer some of the best investment returns of any home remodeling project. 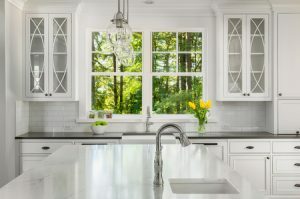 If you want your new kitchen to have a light, airy and open feel, you might want to consider installing glass-front cabinets instead of traditional wood-front options. Today we’ll look at a just a few of the many reasons homeowners choose to add glass-front cabinets to their kitchens. Kitchens can get pretty messy, particularly if you like to entertain guests and cook meals for large groups of people. Although it can be difficult to remove stains and smudges from wood-front cabinets, cleaning glass-front cabinets is quick and easy. All you need is a bottle of glass cleaner and a fresh hand towel. Glass-front cabinets also offer a great way to creatively display your favorite dishes, bakeware and serving sets. This way, you don’t have to hide your heirloom china in the back of a dark drawer. Having glass-front cabinets can also be a good incentive to keep these items neat and organized. If cabinets with clear glass panes don’t appeal to you, you can outfit your cabinets with patterned glass as well. We offer patterned glass in a diverse selection of textures, styles and opacity. This can allow you to customize your glass-front cabinets to suit your kitchen’s unique design aesthetic. Interested in learning more about how we can help upgrade your kitchen with glass-front cabinets? Just give us a call or contact us online today!